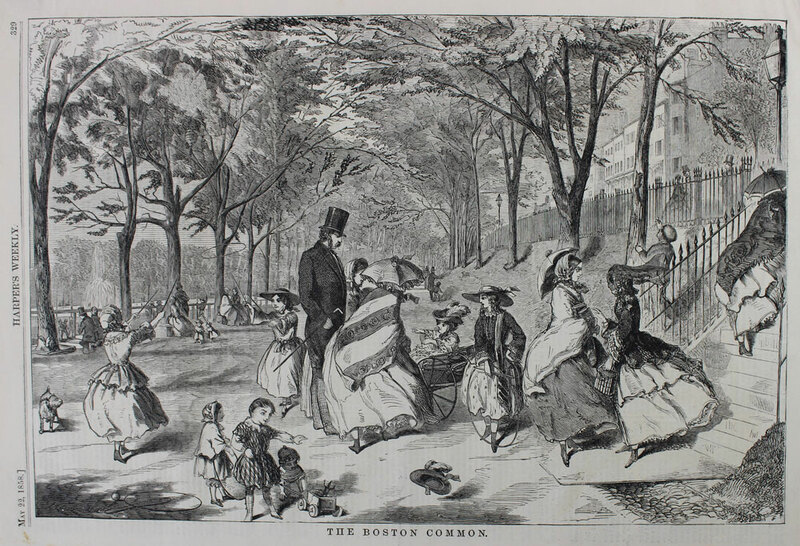 Winslow Homer, The Boston Common, 1858. Gift of Emma Martin. DU1946.446. In the United States, we speak of the American Dream. We dream that, no matter where we start, any of us can reach soaring heights with appropriate effort. We are told stories of people who “pull themselves up by their bootstraps,” doing the impossible to climb the social ladder and land at the top. These stories fuel the glimmer of hope in our eyes as we scroll through our Instagram feeds and watch reality shows that sell us the lives of the rich and famous. Our reality, however, often misses the mark of equality of access and opportunity, leaving out many members of our society based on race, gender, and class, among other factors. Walking through the Denison Museum’s exhibition, Defining Childhood: Growing Up in the U.S. (1860-1940) we can see idealized images juxtaposed with the sometimes harsh realities of childhood that many face. Childhood has not always been believed to be a time of innocence as many feel now. Before the end of World War II, our modern image of the innocent, joy-filled childhood, marked by play, did not really exist. In the past, poor children had been exploited for their cheap labor and their small hands were considered useful in factories, on farms, and in other industries. Boys and girls alike, many the children of immigrants or immigrants themselves. America’s slave past also marked childhood for those who had only recently gained freedom in 1865. Now living under Reconstruction and Jim Crow, growing up black in America was extremely difficult. Struggling under racism and poverty, however, we still see images showing that children found ways to play. The exhibition features artists such as Winslow Homer, John Sloan, and Jerome Myers, whose work idealized childhood or represented the childhood of the upper classes and erased the children working long hours, malnourished, across the country. They wore the rose-colored glasses of the wealthy, depicting leisurely scenes of well-dressed, happy children and their well-off families in the cities and the countryside. In contrast stands the work of photographers Lewis Hine, Gordon Parks, and Frances Benjamin Johnston, who traveled with cameras at their side, snapping photos of children in factories, in urban tenement housing, in alternative and lower-income schools. These artists left their mark on history even as the idealizing works often serve to erase the darker side of American life: The work of Lewis Hine, who worked with the National Committee on Child Labor, heavily impacted child labor laws, showing the country and its politicians what child labor really looked like. This led to protections for children across the country, protections that have been rolled back in the last decade, with some politicians now threatening them further. These photographers cared deeply about the social issues they photographed. While Hine worked to abolish child labor with his photographs, Parks was much more than a photographer. He was a jack-of-all-trades in art: he wrote The Learning Tree, which was later made into a feature film, which he wrote, directed, and scored. His work on this film made him the first black man to direct a major motion picture. He was furthermore an activist in his own right: Parks was deeply committed to social justice, which reflected in his work that focused on race relations, poverty, civil rights, and urban life in order to give a voice to those who were — and still are — often silenced. Frances Benjamin Johnston, one of the first and most prominent women photographers at the turn of the century, concerned herself with issues surrounding education. She photographed both alternative education and progressive education, pioneering the documentation of these movements. She furthermore advocated for photography to be recognized as an artform. It is partially due to her efforts that today it is. Walking around our exhibition space, seeing these stark photographs in contrast with the drawing and prints showing healthy, wealthy, happy families, show us the struggles that many children in American faced and still face today. A few images really stood out to me. Winslow Homer, Gathering Berries, 1874. Gift of Emma Martin. DU1946.492.1. On one wall, we see Homer’s Gathering Berries, which shows a group of well-off children enjoying a day picking berries for fun. Lewis Hine, Norris Lovitt. Been picking for 3 years in berry fields near Baltimore, Md. July 8, 1909. Location: Baltimore, Maryland, 1909. 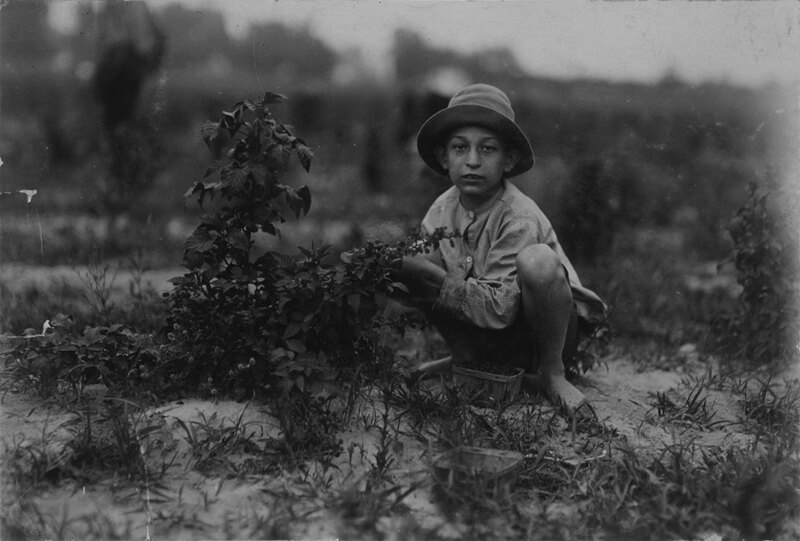 Courtesy of the National Child Labor Committee Collection, Library of Congress. LC-DIG-nclc-00002. Directly above it is Lewis Hine’s photograph Norris Lovitt, depicting young Norris at work in berry fields where he’d been employed for the last three years — he isn’t dressed in his Sunday best like Homer’s children, but has clearly been working hard for what was probably not very good pay. The serenity in Homer’s print is emphasized by a girl’s ribbon floating in the breeze and the calm sea in the background. The young woman furthest left smiles softly as she bends over in the grass, piling sweet berries into her small bucket. This family sees berry picking as a vacation, as leisure. Meanwhile, Norris Lovitt stares into the camera, his face blank and tired. The bush he crouches next to is as tall as his small torso. His feet are bare, and his small basket full. He has no doubt been at work in the sweltering July heat for hours already. We know that he picks berries not because he wants to, but because he has to. 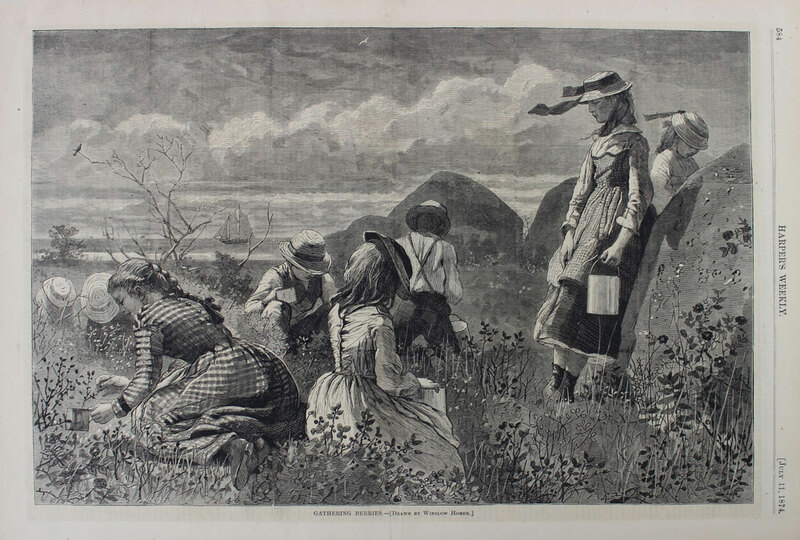 When the wealthy family in Homer’s print gets tired and hot, they can leave the fields or take a break. Norris Levitt, on the other hand, must chug along, using every last ounce of energy he can muster. Education in America is also featured in the exhibition. In one photograph, we see a group of elementary schoolers dressed in posh dresses and clean shoes gathered around a museum display, while in another, Johnston’s photograph of Carlisle Indian School, a group of young Native American boys, learn to operate industrial washers. Each image tells a different story of how education worked in America for different children, depending on their socio-economic status. The “industrial school” for Native Americans wasn’t really a school as we would imagine it at all. Half of the day was spent learning about the history of Euro-American culture, while the other half consisted of students doing jobs such as laundry, cooking, or farm work, in part to keep the school running with fewer employees. 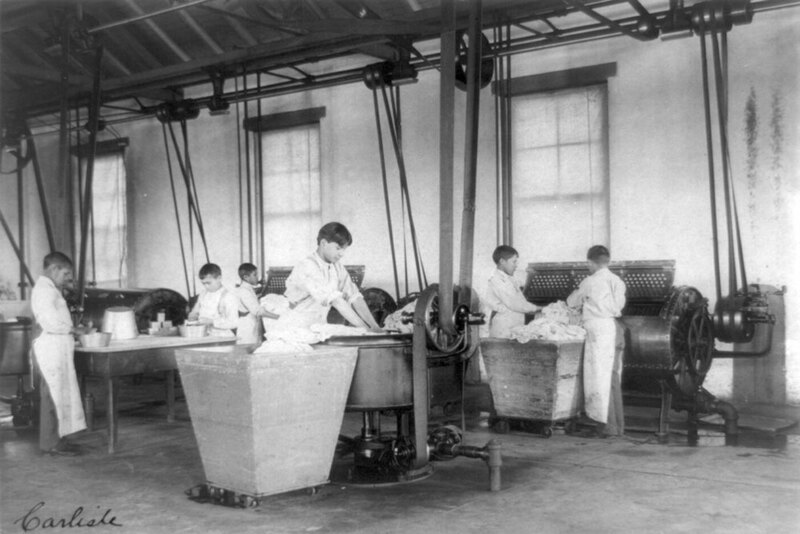 Frances Benjamin Johnston, United States Indian School, Carlisle, Pa., six boys doing laundry, 1901. Courtesy of the Johnston (Frances Benjamin) Collection, Library of Congress. LC-USZ62-95794. These machines tower over the boys, the vats of clothes wide and deep. Johnston’s photograph is about much more than boys learning to do their laundry. These are boys at work after half a day of schooling, doing the laundry for their classmates, friends, and the school staff. This image reflects the legacy of Native boarding schools such as Carlisle. There is no way to separate Carlisle’s first headmaster, Colonel Richard Henry Pratt, nor his motto from the school’s legacy: “Kill the Indian, save the man,” Pratt touted. Carlisle erased Native culture: their long hair was chopped off upon arrival at the school, their native languages were banned and sometimes literally beaten out of students. The children were required to spend breaks and summers with white families in order to assimilate them to the dominant white culture. Upwards of 200 children died within the confines of that school, miles away from their homes, their families, and their cultures. 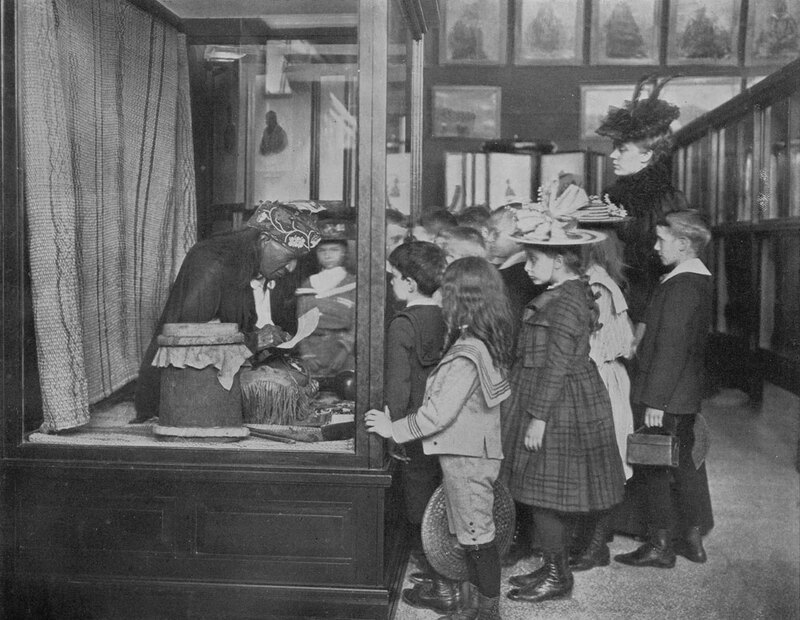 Frances Benjamin Johnston, At the museum - fourth grade, 1900. Courtesy of the Johnston (Frances Benjamin) Collection, Library of Congress. LC-USZ62-138996. Within this photo, though, we see a group of fourth graders and the kind of education that we probably wish for our ourselves or our own children: an exciting outing to a museum, engaging in hands-on learning on a field trip. What a difference in opportunity! In all the different images of education, we see discrepancies between whose classroom appears well-stocked with supplies, whose isn’t. Education takes different forms for different students depending on their status in America. The photos by Gordon Park stuck out to me especially. Looking through his photos of childhood in the black communities of New York and Chicago, signs of their poverty are everywhere. But his Harlem Newsboy struck my heart. Gordon Parks, New York, New York. 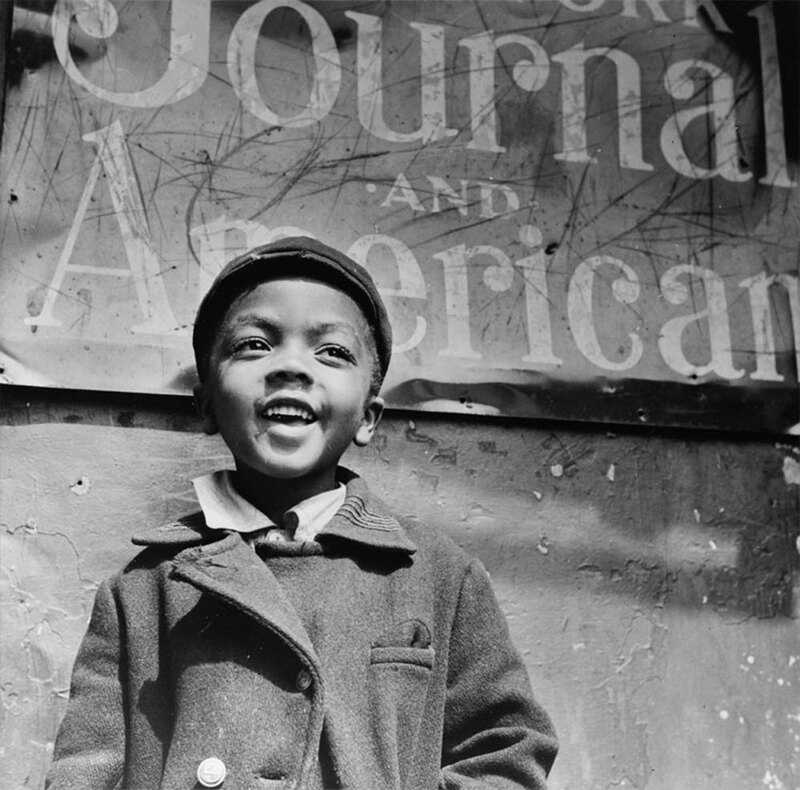 Harlem newsboy, 1943. Courtesy of the Farm Security Administration - Office of War Information Photograph Collection, Library of Congress. LC-USZ62-131436. I wondered, how old is he? Six, maybe. Perhaps younger. I can imagine him standing next to me, no taller than my hip. He is beaming with a huge grin, round cheeks drawn into a joyous smile. In his eyes, I saw the familiar shine of innocence we tend to associate with childhood today. I can imagine his voice, his cadence, high pitched and excited, bursting with boundless energy. I can imagine him running to and fro, laughter dancing through the air. But, this boy, for all his joy, is not our American Dream. He looks to us in the image like a child filled with joy. But his life isn’t filled with the fun and play of Winslow Homer’s Boston Commons or the wealthy shoppers of Sloan’s New York. The Harlem Newsboy, like the other Newsies of New York, worked hard hours in all weather conditions for little pay. He is the kind of child forgotten by artists like Homer and Sloan, but he and others have been preserved for history with the flash of activist-photographers’ cameras. By pairing idealized prints and drawings with photographs of the sometimes gritty reality of childhood in the United States we get a bigger picture view of our history and can better understand the world we live in (and want to live in) now.